Great home in a quiet area with views of acres of farmland. Bright open floor plan, 3 bedrooms and 1.5 bathrooms. 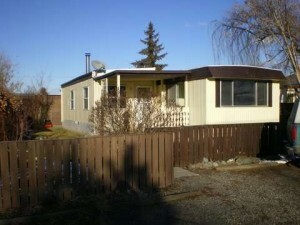 Well maintained home with numerous updates including wood stove, flooring, paint and more. All appliances and window coverings included. Large private yard that is fully fenced and landscaped with fruit trees and a storage shed/workshop. Two covered decks allows you to enjoy nature.The addition was a factory addition and to code. This is a very small quiet park and allows small pets. Park will sign a site lease.